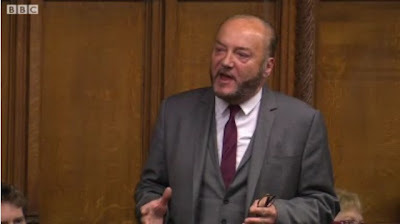 The highlight of today's Prime Minister's Questions was undoubtedly David Cameron's blistering response to George Galloway, the rarely-sighted (in the Commons chamber, at least) Respect MP for Bradford West. Galloway had asked a characteristically orotund question, inviting the PM to "adumbrate" the differences between the "hand-chopping, throat-cutting jihadists" of Mali, currently being suppressed by French forces with alarmingly growing amounts of British support, and the superficially similar jihadists in Syria whom we are currently aiding in their struggle against the Assad regime. He wondered if Cameron had ever read Frankenstein. Cameron's reply: "There is one thing that is certain: wherever there is a brutal Arab dictator in the world, he will have the support of the honourable gentlemen". A fair enough point, though one can quibble that George can be equally keen on non-Arab dictators such as the current rulers of Iran. Tony Blair used to say much the same thing about Galloway's support of Saddam Hussein, usually just before he jetted off to Tripoli to have a cosy chat with his friend Muammar Gaddafi about which dissidents the colonel wanted the British secret service to help him round up that week. But it would be wrong to accuse David Cameron of similar double standards. Not on the day he boards a plane to Algeria to hold talks with the famously human-rights friendly government there about the next steps to be taken against the "existential threat" posed by al-Qaeda linked militants in North Africa. Fundamentalist Islamic militants in Syria pose no similar threat to Western interests (keep up, George, you ought to know this) because they are Salafists, funded largely by our great ally Saudi Arabia. If they want to torch a few churches and stone a few adultresses as part of their purification of the country from the Assad family and its heretical Alawite hangers on, well, that's their business, not ours. Galloway has a point, of course. The Malian army, given the upper hand over the library-burning fundamentalists by the French on their post-colonial jolly, have indulged themselves in random killings and revenge massacres every bit as brutal as those perpetrated by Assad's bashi-bazouks, and far worse than anything laid at the door of the official Syrian Army, which has by all accounts remained fairly well-disciplined. As one woman of an ethnic group targeted by government forces put it, "we have stopped wearing our traditional clothes—we are being forced to abandon our culture, and to stay indoors." Well, "there's a risk" of that sort of thing taking place, said the French defence minister with a Gallic shrug. Stuff happens, after all, as the much-missed Donald Rumsfeld used to say. It's not the realpolitik that offends me. It's not even the hypocrisy. It might be that a sober calculation of the national interest really did require propping up dictatorships against fundamentalist militants in one part of the Muslim world, and supporting Jihadist insurrections against dictatorships in another. It used to make sense to treat Mubarak (in no sense a Gaddafi) as an important and valued ally; just as it now incumbent upon our leaders to make clear that he was a rotter all along and deserves to be in a jail cell. In the case of Mali, Cameron seems to be driven by a combination of the usual Churchill-envy (or perhaps more immediately Blair-envy) and under-the-table commitment to an EU partner that may well be out of its depth. Or perhaps he just wanted to tick Mali off the list published last year of the 22 countries that Britain had never invaded. Whatever. The liberation of Timbuktu, although marred by the destruction wrought by departing Islamists, has been sufficiently exhilarating to produce a rush to the head similar to a lucky streak at a casino. Now is actually the time to get out, not to pile in. As Afghanistan shows as clearly as could be shown, what comes next will be a long drawn-out and infinitely frustrating. The rebels may have run away, but they'll be back. But interfering in Mali, right now, is almost irresistible. The game's a familiar one. Choose your friends, overlook their atrocities (while playing up the atrocities committed by your enemies), dig out Orwell's dictionary of political clichés ("standing shoulder to shoulder", "freedom and democracy", "bloodstained tyrants": they were all present and correct in 1946) and make out that while the Western world is engaged in an "existential, decades-long struggle against" against this group of extremists, that group of similarly-motivated extremists are freedom fighters. Sometimes it's the exact same people, as when a "terrorist" handed over to Gaddafi for torture turns out to be a key figure in the emergent democratic regime. Oops. Galloway is right about Frankenstein. The point isn't just that Al-Qaeda, or the Arab dictatorships that the West used to support (or in Algeria's case, still do) are to some extent our creatures, bound to turn against us in the end. The trouble with Victor Frankenstein was that, intoxicated with his own brilliance, he was unable to see that anything could possibly go wrong.